Saturday night means game night to many players; in the world of late-night TV it means feeding time for your average movie monster. 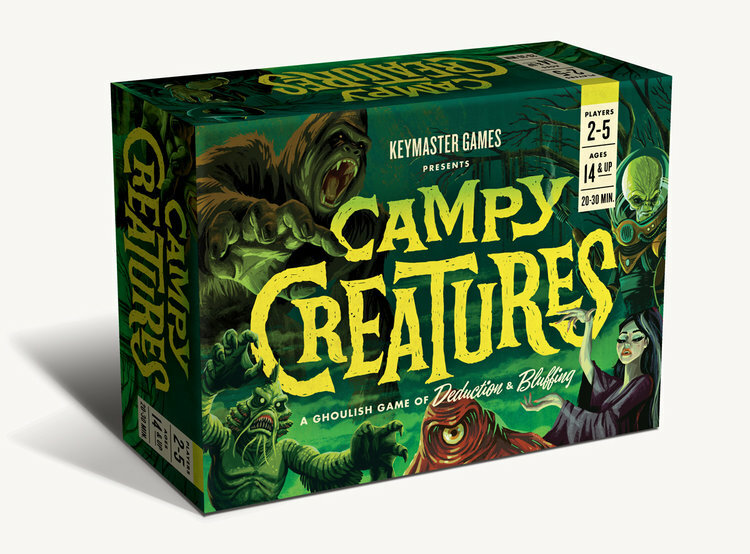 Now with Keymaster Games’ Campy Creatures, one needn’t choose between a horror video and a game: You get an unhealthy dose of both. The object is to score the most points by the end of three rounds. Two to five players portray the forces of evil, though they probably don’t see themselves that way. They likely think of themselves as the forces of eating Pittsburgh or something. Everyone gets an identical hand of cards while one Mortal card per player creeps out of another deck, to be scattered faceup in the middle of the table. Everyone secretly chooses a monster card and reveals simultaneously. 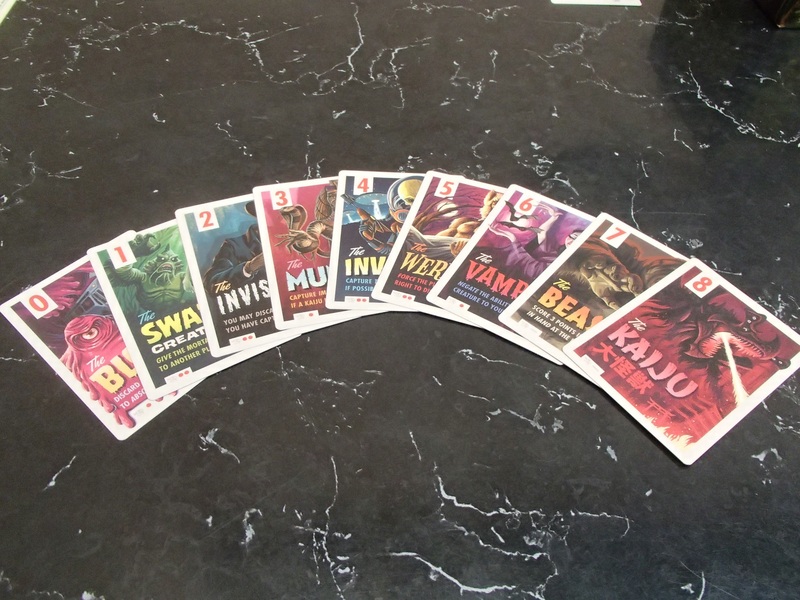 Critters are rated for strength, 0 – 8, and the cards are the same from one person to the next, so for example everyone’s Vampire has the same strength and special ability. The highest card gets first pick of the victims and everyone else chooses in descending order. Victims aren’t all the same, though: Some are worth points, some may score negative points, and some require set collection. The Engineers provide points if one has an even number of them by the end of the round and the Teenagers don’t score anything unless you collect the most. The course of true horror never did run smooth, though, and a monster’s ability might turn events in the game on their head. The Swamp Creature may only have strength 1 but he gives away whatever Mortal he secures that turn – a good card to play if you think you’re about to get stuck with a negative-point capture. The Blob lets you wait to see what others will play . . . but only if no one uses The Vampire to cancel that special ability. If ever there’s a tie (as there so often must be when everyone’s playing the same card values as their enemies), it’s broken by whoever is atop the tube-like Clash-O-Meter. Everyone has a curved little player identifier that sits neatly inside this cardboard “cylinder,” and if they win a tie their token falls to the bottom of the test-tube. They won’t be winning the next deadlock . . . When there aren’t enough Mortals remaining the Creatures tally their points; return their prey to the deck; and retrieve their spent cards. The next round starts, and when three rounds have passed the player with the highest total score displaces that radioactive lizard fellow as King of the Monsters or whatever royal title they bestow among their social grouping. For a bunch of feral or bloodthirsty predators, the Creatures have some pretty sweet components working for them. The cards are big, bright (well, as far as contrast goes, anyway – monsters like the dark), and beautiful. The beasts all resemble old Universal horror posters while the Mortals speak to lobby cards from the halls of the local bijou, all monochrome streaks of artfully applied angry paint. The Clash-O-Meter is probably unnecessarily fancy but it is glorious to behold, a neat graphic way of indicating tiebreakers. Cards have eye symbols (eye-cons – get it?) in all the right spots to remind you which color or critter you’re playing, and the Creeples are nifty too, each a different color and shape. 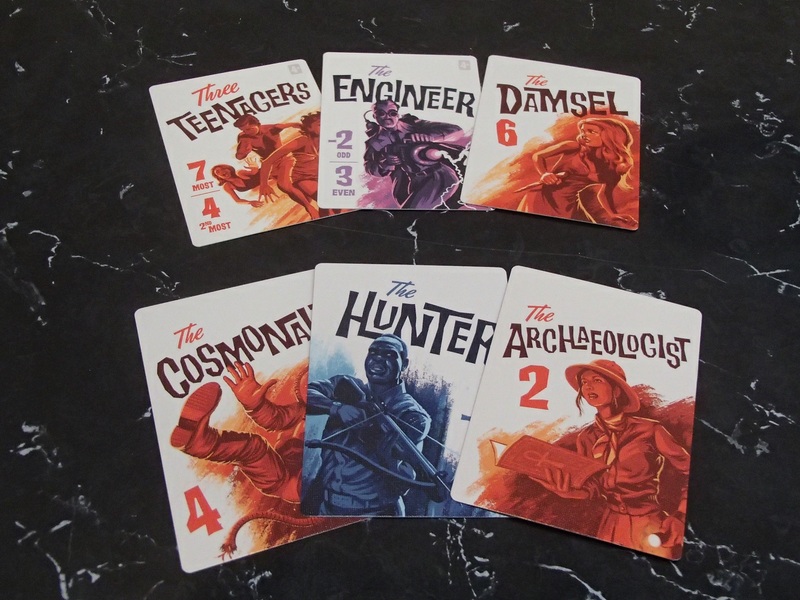 Like any new game the powers from all these cards take a little getting used to, but they form the basis of an effective and entertaining system of groupthink. Is someone going to go high-power and wrench away the best Mortal through brute force or do they resign themselves to getting the worst card out there – and then use The Swamp Creature to force their negative-point “winnings” on their unfortunate neighbor? The Beast is worth points all by himself if he remains unused, but he’s also got a high strength. Can you afford not to employ him to grab what you need? Fighting as one must on many fronts – getting the Mortals one wants while fending off supernatural competitors – it can be a complicated, interlocking web of abilities, but it’s not such a dizzying array you can’t pull it off. There are a couple of neat twists offered like playing best two out of three or adding a press-your-luck monster called The Demogorgon who recycles victims, so replay value won’t run out for quite a while. 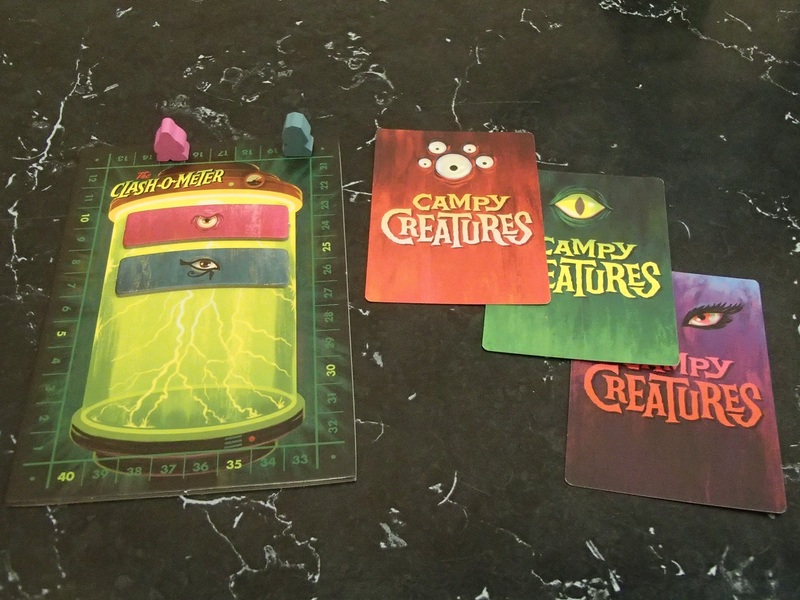 Possessed of a dry wit and a fantastic commitment to theme, Campy Creatures is quite the little powerhouse of a game. It’s enough to keep you guessing, and to keep you up late into a Saturday night.